The idea of tearing down a section of highway 280, north of 16th Street, is taking a firm step forward with the launch of a new study by the Planning Department. Although the department has already released a study of the option in December 2012, the new initiative would take a deeper, more comprehensive look at the “spiderweb” of interconnected transportation infrastructure plans in the area, said the Planning Department’s Susan Gygi. Altogether, plans for the area include the conversion of the 280 stub into a boulevard and housing, the Caltrain railyard redevelopment, and the planned rail electrification and downtown extension of Caltrain and CA High-Speed Rail to the Transbay Transit Center. “Once you touch one, it radiates throughout the web and affects everything within the area,” said Gygi. The study certainly won’t be quick — it’s not expected to be completed until as late as June 2016. But it could set the stage for funding and implementation, preceding the environmental review process and the development of a detailed plan to pursue. What’s the point of I-280 past 101? The two highways run parallel and close enough that it seems pointless to have both. We’re talking about I-280 north of Cesar Chavez St, right? I had to dig back through 5 linked articles to find any specific definition for the “northern stub” of I-280. [Paraphrased from the Wikis]…this stub is known as the Southern Embarcadero Freeway, a piece of what was supposed to be a circular freeway system connecting it to the Southern Freeway (this is the existing section) and then continuing onto Junipero Serra, Park Presidio, Doyle Drive, the Embarcadero Freeway and that piece of the Embarcadero Freeway once known as SR 480. The whole top section would’ve been renamed I-480. BTW apparently we had the chance to get this stub done away with after the ’89 quake but I guess the Freeway Revolt folks got no further than the northern Embarcadero Freeway, so instead it was repaired. I-280 is effectively an express street to get to Downtown & SoMa. The traffic is so low that it is far below Caltrans’ standard for whether or not a freeway should be built. (e.g. if a rural highway gets busy enough, Caltrans starts to consider whether it should be widened, then made into a divided highway, then a freeway). This doesn’t make the cut. If there are a bevy of benefits from taking the freeway down, and those benefits either pay for the demolition, or the cost is not mega-large, then it should come down. Andareed, you could ask the same question about the entire length of 280. Unlike 101 which runs from Mexico to Canada, 280 is a relatively recent and short freeway that exists only between San Jose and San Francisco. 280 exists as a parallel alternative to 101 along what is probably the busiest stretch of 101 between Ventura and Seattle. At least around San Francisco the point is that 101 serves north, east and the Bay Bridge, while 280 serves south, west and the Golden Gate bridge. 280 north of the 101/280 interchange isn’t heavily used, and is only four lanes in total. But the issue is going to be what the impact on 101 and local streets would be if the traffic on the northern spur of 280 was diverted. The build-up of SOMA, Mission Bay and the ballpark should have increased demand for that spur. And if the Warriors stadium gets built, even more so, although I believe that won’t have much parking associated with it. An Octavia Avenue solution might work well, although look at all the fights that went on about that. Simply tearing it down without a decent alternative route might be a problem. They are only considering tearing it down north of 16th (well technically slightly before that). Take out FeeWay, replace with Rail, Bike and walking = Happy healthy people and a better city. The local Nextdoor group is having a(nother) freak out about this, apparently this could lead to dogs and cats living together. 101 runs from Los Angeles to Olympia, WA. The sections south of LA and north of Olympia were replaced by I-5 in the 1970s. The point is that 101N is stop and go most times of the day from Cesar Chavez to the Bay Bridge. So 280 alleviates a lot of the traffic for people going to downtown or SOMA. For those of you stating that I-280 doesn’t carry much traffic..simply false. The freeway carries nearly 120,000 vehicles per day, north of Cesar Chavez Blvd, and suffers from stop-and-go traffic during peak hours. 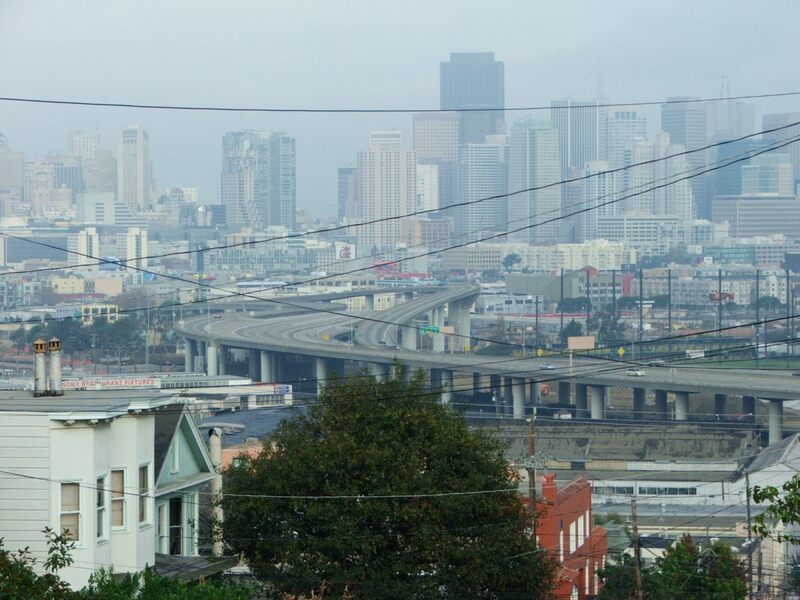 When the freeway was shut down entirely after the Loma Prieta earthquake, traffic volumes along US 101 from I-280 to downtown SF shot up to approximately 300,000 vehicles per day…about the same number of vehicles that utilize dreaded freeways like I-405 on the westside of Los Angeles. Think about that, before you *really* want to remove the northern end of I-280. It definitely serves as a very useful route, into and out of San Francisco. Having lived for years on Brannan between 5th and 6th, I can tell you a huge chunk of the 280 traffic is 101 bypass. There was always a long line of cars, especially in the evening, getting off 280 at Brannan, going to 5th, and then getting back on 80 to cross the bridge. 280 north of 16th st hurts bridge traffic by causing excessive merging traffic.